-"Do you have any advice on passing the CPJE??" -"How do we prepare for CPJE? I'm so worried about the exam." -"The process to pass the CPJE takes about four or five months. I took the test in January and failed. Help!" What could I possibly write about to help out my beloved tl;dr readers? I ended up writing about a new drug approval and a review of a great financial book for pharmacists. But behind the scenes, I was working. I was delving deep into research about the CPJE. You see, the problem is that I don't live in California. And as much as I love you all (and would do anything to help you), I have to draw the line at "Taking a licensing exam for a state I don't live in." So I reached out to your fellow tl;dr pharmacy readers, and asked them about the CPJE. I reached out to people I personally know who've passed the CPJE. I researched online to learn everything I could about the CPJE. And this article is the result of all of that research. So for the obvious upfront disclaimer, I have never taken the California Pharmacy Jurisprudence Exam (CPJE). And what you read here will not be the only resource you need to pass. But what I'm hoping to do is to give you some key pointers to help guide your studying. And judging from the feedback I've received on our PCOA post (another exam I haven't personally taken), that should be a pretty good starting point for you. The CPJE is the exam you must take (in addition to the NAPLEX) to practice pharmacy in the state of California. But I'm sure you knew that already. I'm not going to get all into the nitty gritty of how you apply, and what's required for your background check, etc... You can find all of that information here, and I'm pretty sure that's not why you're reading this article. The first step to preparing for any exam is to know what you're being tested on. You need to study the outline of the test--similar to how a military general needs to study the layout of the land before going to battle. Otherwise, how are you going to know where to focus your study efforts? You can snag an outline of the testing materials for the CPJE here (there's a lot of other info in that link, so you have to scroll down a bit to get to the outline. There's also some practice questions in that guide, so I highly encourage you to check it out). All said, there are a total of 75 "real" questions (20 + 33 + 22). Then there are 15 additional questions that don't actually affect your score. The CPJE throws these in there to test out future exam questions (the NAPLEX does the same thing). All of the questions are multiple choice (and there may even be a few K-type or multiple-multiple choice questions thrown in for color). So in total you've got 90 questions on the CPJE. And you've got 2 hours to complete it (i.e. you have to force yourself to move quickly if you're a slow test taker). It's also important to note that you cannot skip around on the CPJE. Once you advance past a question, it's gone. And similar, if you decide you want to change your answer to a previous question after it's been submitted, you won't be able to. So make sure you're thoughtful and certain with every choice you make (unless you're running out of time and just answering questions randomly so you don't leave any blank). The way the test is scored, it's in your interest to answer every question, even if it's a blind guess. So make sure not to leave anything unanswered. And so now we get to the crux of this article. What is it about the CPJE that makes people fear it more than even the NAPLEX? I think it boils down to a difference in expectations. You're "expecting" this to be a law test. That's what the "JE" part of CPJE is for, right? And if you've ever taken an MPJE, that line of reasoning holds up. But this just isn't the case with the CPJE. Overwhelmingly, the most common bit of CPJE advice I got from polling tl;dr readers and my personal connections was to "study for it like the NAPLEX." The best way to pass the CPJE is to study for it like you study for the NAPLEX. The state of California even tells you that (indirectly). Look at the content breakdown from above. It is very clear from the number of questions in each category that the test is more "clinical" than your run of the mill MPJE. The majority of the test is dedicated to "Patient Outcomes" (which I'm guessing don't involve questions about how long a CII prescription is valid once signed). Some of the people I spoke to said that there were less than 10 "law" questions on their exam. I keep emphasizing this point because it's that important. While I wouldn't recommend you ignore the classic law questions completely, you have to prioritize your studying on the clinical aspect. In fact, if you haven't taken the NAPLEX yet, you can probably save yourself a bunch of study time by scheduling it relatively close to the CPJE. That way the information is still fresh in your head. If you need some help prepping for the NAPLEX, I wrote this post to get you up to speed. So, I've told you a few times now to study on "clinical" content. What do I mean by that? For starters, you must know brand/generic. I've mentioned this point before, but it's worth repeating. If you don't know what the brand name of a drug is, you'll never be able to answer a question about it. And the CPJE incorporates brand/generic questions in clever ways. For example, you might be asked what auxiliary labels need to be included with a prescription for Mepron. If you don't know that Mepron is a suspension, you're probably not going to select the "Shake well before use" answer. And you'll get that question wrong. Alternatively, you might be given a list of adverse effects and asked "which of the following side effects do you need to monitor for Multaq?" How can you possibly get that right (without guessing) if you don't know that Multaq is dronedarone? I'd be familiar with at least the top 200 prescription drugs, as well as drugs that are available OTC. You must also know renal dosing cut offs and therapeutic appropriateness. You might be given a patient case with some background lab info such as height/weight, allergies, SCr or LFTs. You'll then be shown a picture of a written prescription, and asked if you would fill it for this patient. This is a devious question, because you're probably going to start looking at the prescription from a "legal" perspective. You'll make sure there's a patient name and date of birth, drug, strength, refills, and so on. Meanwhile, maybe the patient's CrCl is 25 ml/min and maybe the prescription is for Pradaxa 150 mg BID. The prescription might be 100% correct from a legal standpoint, but from a clinical standpoint, it should not be filled (we use the 75 mg BID dosing for CrCl < 30 ml/min for dabigatran). Sneaky right? But again, you have to bring your clinical brain along for the ride when you're taking the CPJE. What other clinical questions will you come across on the CPJE? Also be mindful about what diluent must be used when compounding a drug. A common example I've come across is amiodarone (which much be administered in D5W; and should be made in a non-PVC bag). It's probably a good idea to make a list of common drugs that can ONLY be given in a certain fluid (such as amiodarone in D5W, or phenytoin in NS), because these are usually where test questions come from. While you're making a list of diluent requirements, also make a list of IV drugs that must be protected from light. IV levothyroxine is a common example here. You're not going to need to memorize Trissel's or anything to get through the test. But use your NAPLEX study guide (we like RxPrep) to get your foundation. This is a borderline "clinical" and "law" study point, so I'll include it here as a segue into the next section of this article. When studying for the CPJE, know which drugs are under a federal REMS program (and what dispensing requirements that entails for the pharmacist). REMS drugs may have very strict dispensing requirements (like checking a CBC before dispensing clozapine). There's also a natural restriction who you can borrow drugs from if your pharmacy runs out (you can't borrow a REMS drug from a pharmacy that isn't registered with the program, because they shouldn't be stocking it in the first place). Here's a complete list of all current REMS drugs. I would mostly pay attention to the common "retail" ones such as isotretinoin, clozapine, and basically every formulation of testosterone. Alright, that about covers the clinical side of the CPJE. Now let's jump into the law section. For starters, I want to mention the two books that were most commonly recommended by your fellow tl;dr pharmacy readers. 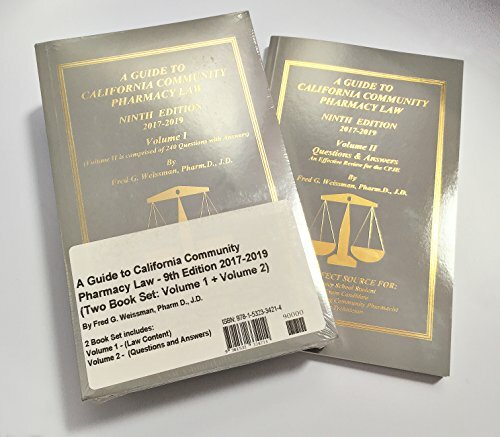 The clear winner (by a landslide) was A Guide to California Community Pharmacy Law by Fred Weissman. From what I hear, it's written in clear and concise way that's easy to understand and there are a lot of practice questions to ensure you've got the major points down. Also highly recommended was RxPrep's California Law Summary. Whichever one you choose, I'd get one of the above books and at least work through all of the practice questions. Even though law content doesn't seem to be emphasized as much on the CPJE as clinical content, you don't want to completely ignore it. There's still enough law questions that you will fail the exam if you miss too many of them. Law questions are specific enough that it's hard for me to make broad generalizations about how to study for them (especially considering I haven't taken the CPJE). Even still, there are some pointers I can give (which have been validated by tl;dr readers who have taken the CPJE). Most law exams have a big emphasis controlled substances. So it's important to make note of all the requirements set by California. How long is a CII valid once written/signed? What are the requirements for transferring controlled substances? Can practitioners fax or e-prescribe CIIs? What are the documentation requirements for record keeping (and how long must you maintain them) for controlled substances? That list is not exhaustive (as it's just off the top of my head). But you get the idea. Controlled substance laws are very important for every state, so it's important to make sure you have California's laws down 100% before taking the CPJE. If you really want to be thorough, we created an MPJE cheat sheet to help guide your law studying. If you're able to answer every question on the sheet, you'll be more than ready for the law portion of the CPJE (again, you need to do a lot of clinical studying too). Both drugs have 50 mg of butalbital (a controlled substance) and 40 mg of caffeine. Fioricet has 300 mg of acetaminophen, and Fiorinal has 325 mg of aspirin. The only difference between Fioricet and Fiorinal is that one has acetaminophen (Fioricet) and one has aspirin (Fiorinal). Home sweet home. Where Fioricet is a C-III and crab cakes and football are "what you do." So it may come as a surprise to you that (at least federally), Fiorinal is a C-III while Fioricet is listed as non-scheduled. Again, that's at the federal level. There are some states (for example, my home state of Maryland) where Fioricet is also a C-III. The reason for this seeming contradiction is the relative amounts of non-narcotic. The Controlled Substance Act listed specific ratios of non-narcotic that could be mixed with narcotic to lower the abuse potential (and therefore make the controlled substance laws less strict). This site does a phenomenal job at breaking down the ratio differences (with math! ), so I'll let you read there if you're interested. My final bit of advice for the CPJE is to do as many practice problems as possible. That's the only way you'll get a true feel for what kind of questions will be asked (and you'll reverse engineer your way into learning California law in the process). Here's a 78 question practice test (provided by the State of California, no less). And here's a link again to the CPJE outline (which has an additional 22 questions). Both of those practice tests have the answers provided, so you're really doing yourself a disservice if you don't go through them a few times. Don't shoot yourself in the foot. Do the practice questions. The State of California also has two self-assessment forms it provides for people that are starting up their own pharmacy. You can go through these documents to give yourself a handy checklist of potential testing points. Here's the community pharmacy self-assessment. And here's the compounding self-assessment. There are some common multiple choice testing tricks to watch out for on the CPJE. These are common to every law test (and really, they're common to every multiple choice test). But it's worth reminding ourselves of them. In the high-stress environment of a test, it's easy to miss a key word that completely changes the meaning of the question. Be careful of the words "should" versus "shall." In legalese, the word "shall" means that you must do whatever thing the law is saying. It's a requirement. "Should," on the other hand, is just a recommendation. When you're studying (and when you're taking the CPJE), make careful note of which word is used; and answer the question accordingly. Also be mindful of questions that ask "All of the following do _____, EXCEPT." Or another version, "Which of the following is NOT true?" I made it super obvious by capitalizing the words "except" and "not" in the examples above, but that doesn't necessarily mean the CPJE will. There may be no bolding, italicizing, or capitalizing on the test. So you've got to make yourself slow down and read the question carefully. What I normally do before answering any test question is to quickly scan it looking only for exception words like "except" and "not." Then I make sure my answer is still true (because pretty much by definition, exception words make the opposite answer correct). Another common tripping point on law exams is the word "best." Such as "Which of the following is the best choice?" These questions are the worst. You'll have several choices that seem correct (and maybe even technically are correct), but you have to choose the "best" one. I don't have an easy fix for these questions. Just try to be on the lookout for them, and take extra care in choosing your answer. That should give you a pretty good starting point for how to approach the CPJE. Keep your studying primarily on the clinical aspect, and use the tools available to streamline your law studying as much as possible. Remember, I haven't actually taken the CPJE. All of the above is information I've sourced through tl;dr readers and friends who have passed the CPJE. And also a healthy dose of internet research. I'd also like to give a huge shout out (and say thank you) to everyone that helped me write this article. If you've taken/passed the CPJE and feel like I've missed something that could make this article more helpful for others, please email me at mail@tldrpharmacy.com. I will update this page periodically as more readers email me more tips.